“Use natural Latency” -> Automatic. Under the assumption this is the default, I put it on the left as the thing to start from. 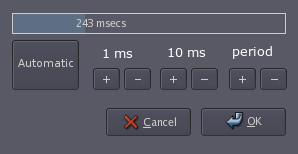 It should be a toggle button to inform the user if it is on or not (clicking the other buttons should disable it) . Adding the value it will result in as part of the label in parenthesis or as tooltip would be good, but I’ve been told that value is not readily available. Using 2 rows allows to split step size and direction. Same size buttons avoid an overly busy layout. If custom widgets are an option. I don’t find the second one overly busy, even though the same thing is showed a few times it still looks simple and my eye catches it directly, so it’s not really confusing or anything imho. I think the reason for this is because it is the way it is done in many other applications. On the other hand, number 3 is – in theory – easier on the eye, but in practice it isn’t because I haven’t seen it like this in other applications so the very first time i looked at it there was a very short delay of getting used to. Nonetheless number 3 is probably the best bet. Make the widget mainstream. If all applications (they should!) start implementing them like that we’ll get one step closer to utopia. I do think the custom widgets need some tweaking, they aren’t really “keep it simple”-styled like other gtk widgets are. This is caused by the 2 lines in the middle-left and middle-right. Also the fact that the plus and minus signs are wrapped inside an ( unnecessary ? ) circle has something to do with that imho. I’m thinking about how you could make them simpler but as effective but can’t figure out something at the moment. Dieter: the lines are meant to give a hint at the button having 2 separate areas and where the division is. Plus and minus are wrapped in circles because a naked minus looked out of balance with a plus on the other side. I also tried triangles, but that looked more like it was about changing the value of the label. havig the combined buttons isn’t as clear to me as the separate ones. If I didn’t know better, I wouldn’t know what the combined buttons mean. PS: I also made http://dieter.plaetinck.be/files/latency_dialog_04.png and afterwards (when rereading your comment) I realised you tried this already. You’re right about triangles often being used to change the value of the label, that might be a little confusing. That’s why I think option 5 is better. The minus sign is a bit larger then the minus sign you got on example number 2. I never programmed gtk but can’t you specify a font that is a little larger for the minus sign, or something like that? Or another font altogether because it seems odd to me that a minus sign is supposed to be shorter then a plus sign. Dieter: regarding 05: I considered that and decided against it because you lose the space needed for the labels as target area.